He made Kevin Bacon mad. One obvious item of genuine dispute is the trademark on the name itself, and while I can't comment on where the ownership truly resides by the letter of the law at this moment, it's pretty clear that P&F were happy to give up ownership over that particular piece of the game at some point in the past. They never owned it. F&P were contracted by Accolade to create Star Control. Thanks for the clarification. That drives the point home even more strongly. This and this on top of all the email correspondence where Brad tried over and over and over to work with them only to have them refuse. Wait 25 friggin years then try to sabotage the effort to bring back something near and dear to our hearts. I love the game Paul and Fred helped create but their behavior is just deplorable, DMCA abuses aside. As many have already said, thank you to the entire origins team for making this happen, and this makes me wonder, If Brad wasnt such a huge fan of SC to begin with would this ever have happened? I get the sense from the emails and posts this was more of a SC fan in the right position and the economics just worked out for everyone. You mean the Star Control trademarks and the copyrights to Star Control III, all the art and packaging and documentation. 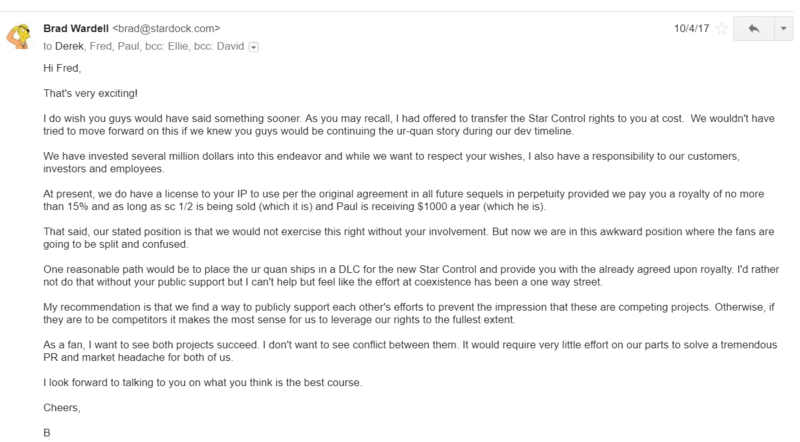 Trademarks meaning the exclusive right to associate your game with Star Control. You keep quoting an addendum for Star Control IV as if it has some sort of legal meaning to Star Control II. I am not suggesting that the DOS source code + some graphical images have no value, but they aren't particularly relevant to the case at hand as we have no interest in the DOS source code or graphics from a 25-year old DOS game. 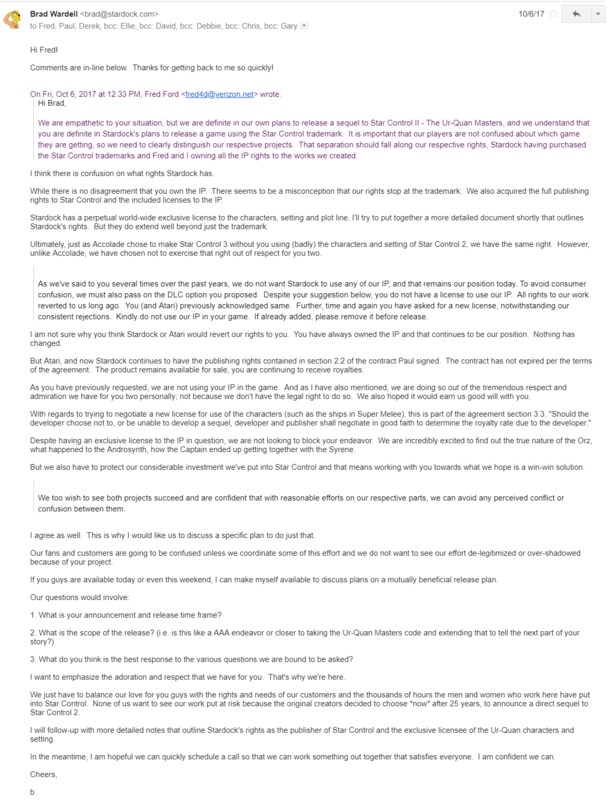 If you want to continue litigating, I recommend going over to the UQM forums where there are plenty of people ready to play pretend lawyer with you. That's... not an addendum. It's an email thread. We certainly know what Paul and Fred claimed to have owned at the time. Events have, however, shown otherwise. But I think we can all agree that Paul and Fred have very broad definitions of what is their property. I don't think there's any dispute about what Paul & Fred own, at this point? They claim a lot of things, yes. Lately they’ve been trying to claim our work too. It seems to be a pattern with them. To claim to own other people’s work. They were very sure of what they had. But somehow still had to ask Brad what he got when buying the IP from Atari. 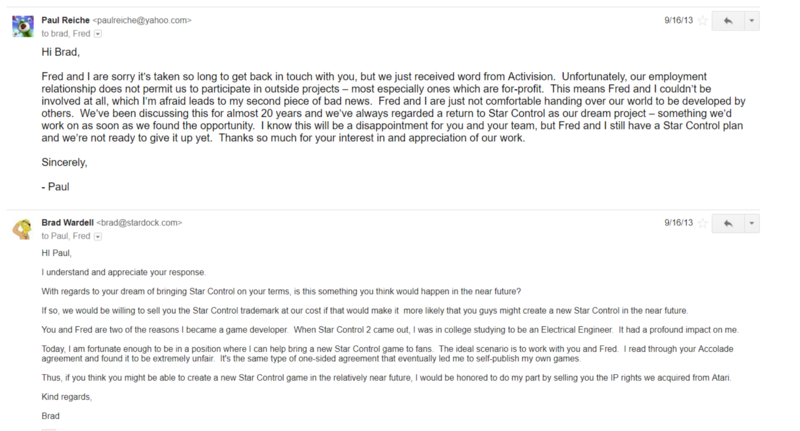 Afterwards giving the excuse that they didn't buy it then because Atari had nothing really of value... besides THE, one and only, "Star Control" TRADEMARK! No, what they seem to care about is the brown sugar within the water of Coca-Cola®™. ... or maybe not. As they ask their fans for 2 million dollars for just a chance to the get the supposedly useless name. 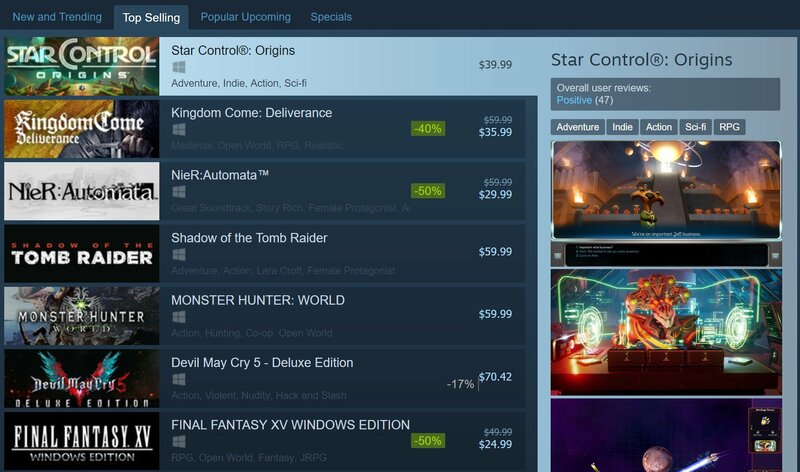 Meaning the value of Star Control™ more than tripled from 400k to 2 million. Everyday someone gives their money thinking they are helping P&F get the trademark AND develop Ghost of the Precursors™, even though development of the game is not mentioned anywhere and no updates are given. They were very sure of what they had. But somehow still had to ask Brad what he got when buying the IP from Atari. I don't know about you, but I drink soda because I like the unique mix of brown sugar within the water, not because I'm impressed by the words "Coca-Cola™". a chance to the get the supposedly useless name. Paul & Fred are defending themselves from the millions in damages Stardock's suit claims. Even if they win, they don't get the trademark. 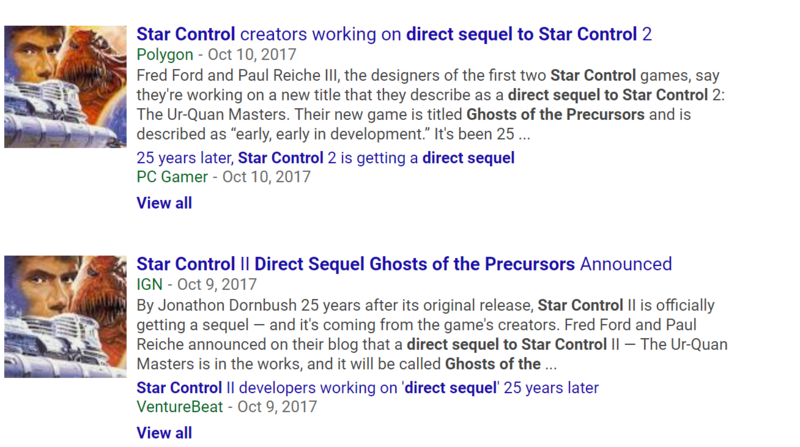 At most, they get the right to say that Ghosts is a sequel to their previous work, Star Control 2. I wouldn't care about your taste. What I would care, is how many people you would be able to convince drinking sugar water. This is what it is all about. Brand recognition of Star Control. So far, SC fans seem to be are adding SC:O to the list of genuine SC games, strengthening the brand. Oh god, then you talking is making everything WORSE! If they don't get the Trademark, they still can't name it "Star Control: Ghosts of the Precursors" without, rightly, Stardock's approval. P&F have been businessmen for the last 25 years shown by the fact that there still isn't any GotP content until they get enough brand recognition to warrant developing the game. Quite sure that without the name Star Control, GotP will flop commercially. I've been away a while and out of the loop in regards to all things SC, only today read about all the legal drama. Having browsed around for info a bit, and looked over the timeline of events on the SC wiki, I honestly dont know what to think. My kneejerk reaction would be to side with Paul & Fred, but I can't wrap my head around some of their actions. -Why would you refuse to buy the trademark to your universe (and thus prevent all these issues to begin with) for 300k, only to later ask for crowdfunding for up to 2 million dollars of legal fees? Seriously? -Paul & Fred have been saying since forever that they'd love to make a proper sequel, but their pitches to the powers that be kept getting rejected, or other difficulties prevented them from acting on that desire. So, after 25 years, on the eve of an early SC:O release they post an announcement with... nothing. Just some text and one old image. Since then there hasn't even been a single update on that site. Stuff like that wouldn't get them 100$ on Kickstarter. 25 years of planning and dreaming and all they have to show is that? Wow. But hey, another company has taken the financial risk of trying to resurrect SC, a plunge they couldn't convince their corporate masters to take, and just when the marketing of the game picks up and "Star Control" starts to appear in gaming media "Oh hey guys, we're finally gonna do it! Really! Here's a blank site with no updates! Here, a crowdfunding site for our legal fees! Hey, hunams, we finally have the balls to act now, just gib some monies!" P.S. I haven't even played SC:O yet, so I can't judge the game. As someone who's still VERY new to all this controversy, I can understand 100% why Stardock (Brad) would protect their IP. Also as someone who's played SCO, I've really been enjoying it even if I'm only 9 hours in! Understandable. Good luck on your launch. Unfortunately, I can't end my little protest until I am sure that your original promise will be kept. I did enjoy participating in the Founders program. Even when we disagreed. Especially then actually. Well I suspect you'll be pleased with the launch. You suspect wrong. Until I know that your original promise will stand there will be no Stardock products on my systems. Adding the Arilou 2 months in after launching without is still going back on your word. The Arilou are definitely in the game though they don't identify themselves as the "Arilou" yet. They're non-infringing ones supposedly. Same background music, same "we've been watching over humans for quite a while" backstory. Their ship is different, and doesn't even show the race name next to ship name. They also talk about the Precursors briefly, how they vanished and left tech for humans... Haven't been able to play much since other games are taking up my free time as well. The Arilou are definitely in the game though they don't identify themselves as the "Arilou" yet. They're non-infringing ones supposedly. All you have to do is look at the StarDock Store to see that both the Arilou and Chenjesu are featured in the game to some degree, even if they're just in Fleet Battles-only DLC. Honestly, the legal argument here is valueless. I don't even care if Stardock has the legal rights it thinks it has to Star Control. I own at least six Stardock games, which I purchased previous to the announcement of Star Control Origins. From my first playthrough of Galactic Civilizations, I felt that the games had potential to be very good. They were admittedly somewhat half-assed and unfinished feeling, but in many ways GalCiv was better than some of the more polished rivals. I was not as happy with GalCiv 2 and 3, though. They were still half-assed and unfinished but without the feeling of potential future (or the excuse of being the start of an idea). As soon as I saw that Stardock was making Star Control Origins, I knew I didn't want them to. I played Star Control for endless hours back in the days of Windows 3.1, and I have been waiting for decades for a real sequel to Star Control II. Stardock, let's be honest, makes games based on other people's ideas, putting out sloppy copies that are never finished. I have never been satisfied with the quality of a Stardock game, but hey, they aren't necessarily terrible. Until you try to slap that half-assed game-copying stuff on Star Control. So here is something Stardock should consider. Given the choice, I would always side with Paul and Fred, because their stuff is actually good. What they have is the Star Control I want. If Stardock gets in the way of that, Stardock loses the chance to ever sell me a game again. If I could divest myself of the games I already bought, and somehow have Stardock lose the money they made selling them to me, I would. 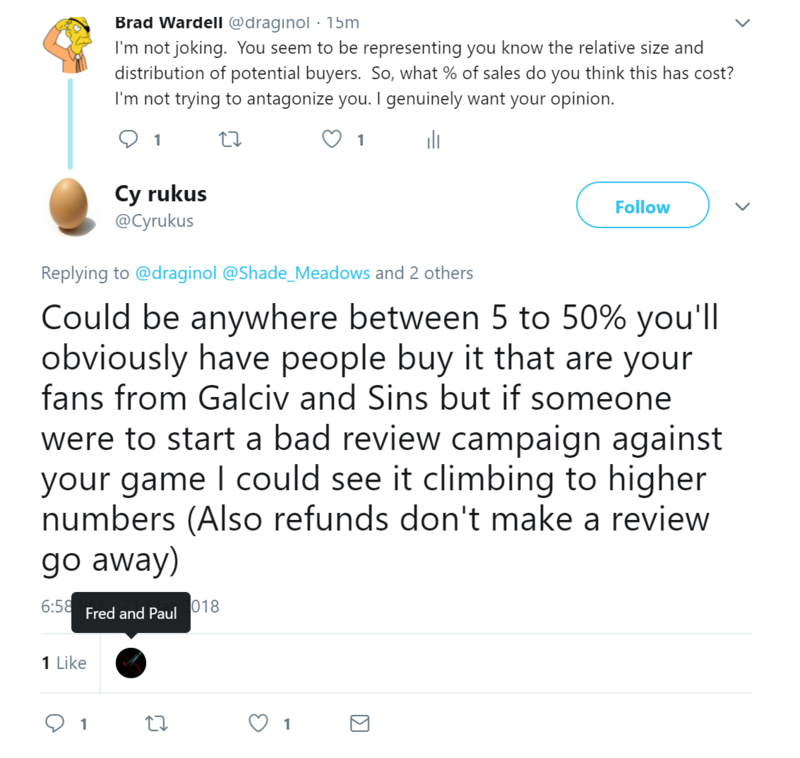 I will tell every gamer I meet not to buy any Stardock games. Some of us have been waiting over two decades for a new Star Control game, Stardock, and your money-grab using the Star Control name doesn't cut it. Your attempts to block a REAL Star Control are enraging. 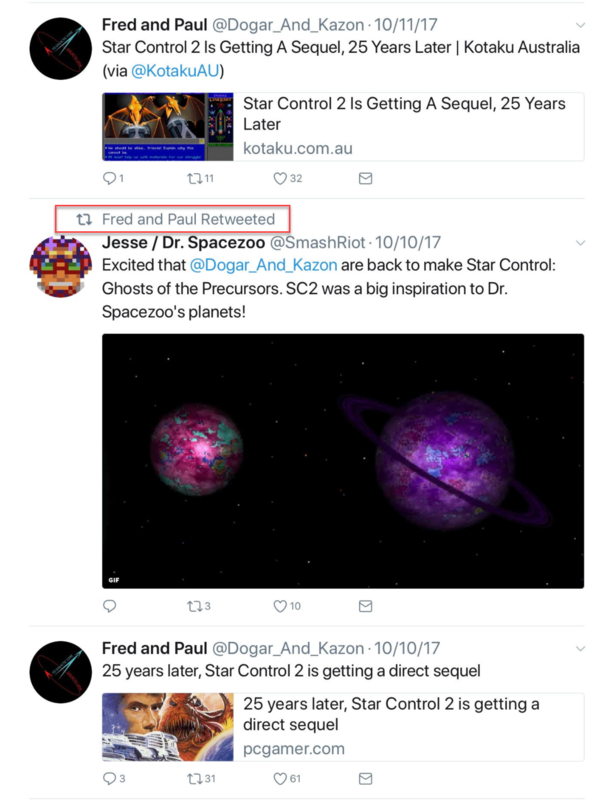 Consider that thousands, tens of thousands of fans have been devotedly waiting for Paul and Fred to release a new Star Control game for 20+ years and then reconsider alienating all of those fans by continuing your chosen course. Even if you have the legal upper hand, and I'm not sure you do, it won't matter if you cause people to stop buying your half-assed games. 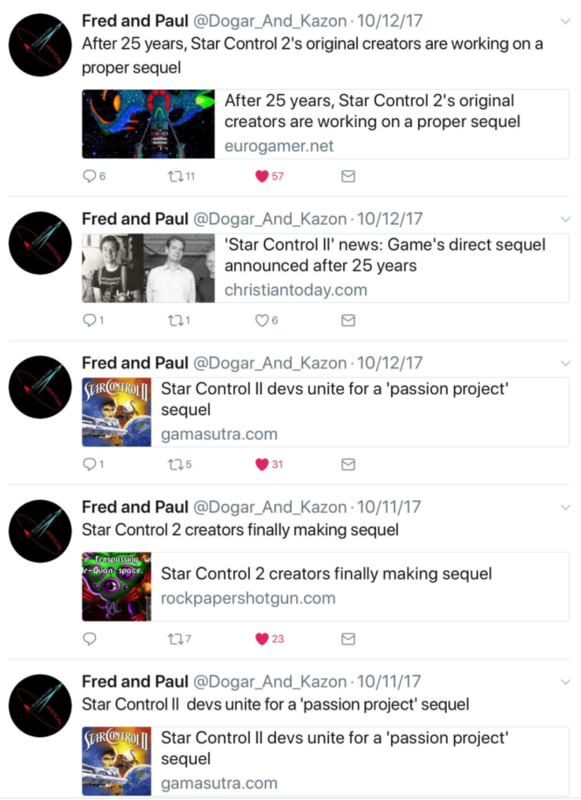 Preventing the release of a future Paul and Fred Star Control is the line. Even gamers that aren't die-hard fans of Star Control II can see the lame money-grab that Star Control Origins is, and gamers can be amazingly touchy. I don't care if you take people's money with your fake Star Control game. But I can guarantee that a smaller company like Stardock, already on shaky ground (major layoffs a while back, right?) cannot afford a large public backlash. It's kinda short-sighted to drive your little company into the ground just so you can keep trying to make money off of someone else's successful works. Anyway, when you release GalCiv 4, don't expect me to be lining up for it. I mean, I barely even touched 3 when there was a real decent game to play out there (Stellaris). But hey, do the less idiotic thing, and go back to your own halfway decent games, leaving Star Control alone, and maybe your sales will drop less. Honestly, the legal argument here is valueless. I don't even care if Stardock has the legal rights it thinks it has to Star Control. You mean buying a game from a company that went bankrupt, so no one would ever would have been able to touch this game again forever disappearing into obscurity. I own at least six Stardock games, which I purchased previous to the announcement of Star Control Origins. From my first playthrough of Galactic Civilizations, I felt that the games had potential to be very good. They were admittedly somewhat half-assed and unfinished feeling, but in many ways GalCiv was better than some of the more polished rivals. I was not as happy with GalCiv 2 and 3, though. They were still half-assed and unfinished but without the feeling of potential future (or the excuse of being the start of an idea). You should try to play the game now after version 1.7 it had been a great game. Polished like it's rivals. The idea was started on a post that said please make this game referring to Galactic civilizations 3 like Star Control, so if you want to blame anyone for this blame a Star Control fan. So here is something Stardock should consider. Given the choice, I would always side with Paul and Fred, because their stuff is actually good. I assume when you are saying thier stuff is good then you aren't talking about Star control 1 & 2, but all the other games toys for bob has put out. If you hadn't played the other games then you can't make this statement. If you hadn't played the other games you should play them. I don't mean something like 9 hours,but over 100 hours each. Hope if you are making this statement you played their other more recent games. What they have is the Star Control I want. If Stardock gets in the way of that, Stardock loses the chance to ever sell me a game again. If I could divest myself of the games I already bought, and somehow have Stardock lose the money they made selling them to me, I would. I will tell every gamer I meet not to buy any Stardock games. Some of us have been waiting over two decades for a new Star Control game, Stardock, and your money-grab using the Star Control name doesn't cut it. Your attempts to block a REAL Star Control are enraging. Consider that thousands, tens of thousands of fans have been devotedly waiting for Paul and Fred to release a new Star Control game for 20+ years and then reconsider alienating all of those fans by continuing your chosen course. You mean the game paul and fred wouldn't have been able to make if stardock hadn't bought the game at the bankruptsy sale. Even if you have the legal upper hand, and I'm not sure you do, it won't matter if you cause people to stop buying your half-assed games. 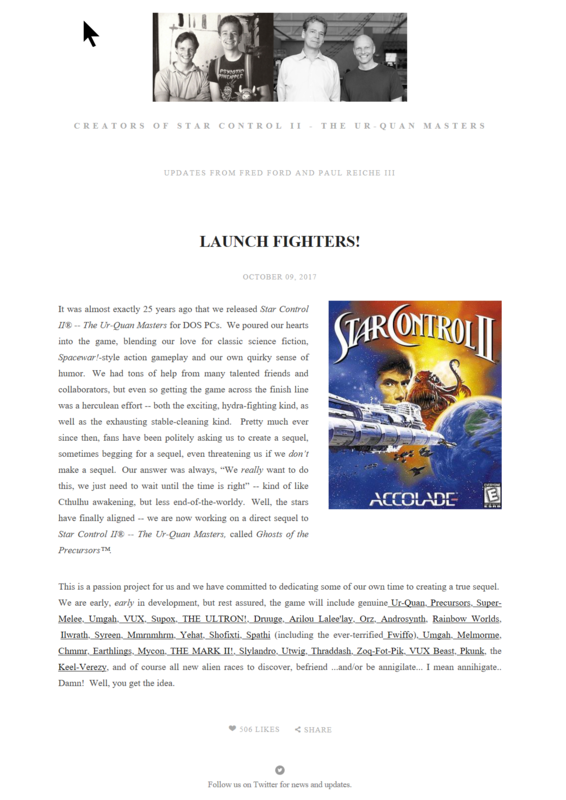 Preventing the release of a future Paul and Fred Star Control is the line. Even gamers that aren't die-hard fans of Star Control II can see the lame money-grab that Star Control Origins is, and gamers can be amazingly touchy. You mean the idea inspired by a star control fan. 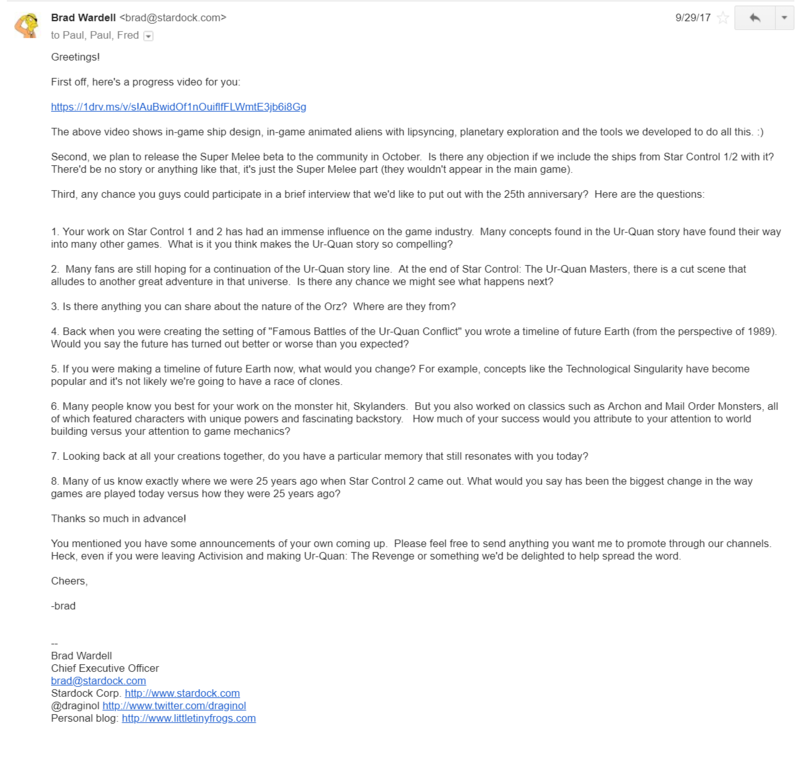 Going off of emails I think it was paul's response to brads wondering why they wanted Star Control 3's source code that Paul insisted that Brad take the name of Star Control off Origins. It was Paul knowing that Brad was going to release the announcment to the new game when he released the trailer. that started this, and this is Stardocks fault this is why you are siding with Paul and Fred. It was brad's idea to talk instead. I was not as happy with GalCiv 2 and 3, though. They were still half-assed and unfinished but without the feeling of potential future (or the excuse of being the start of an idea). Great news! I was looking to get back into space 4X recently and after doing a bit of research on which game might be best, the general consensus I found was that if I wanted deep story telling I should pick up Stellaris (+expansions), if I wanted deep strategy then I should go with GalCiv 3 (+expansions). GalCiv3 might have has a slow start, but at this point, your characterisation of this game is hardly accurate. The Melee combat is much better on SCO. The power-ups are an awesome addition, which can sometimes effect the battle outcome. The variety of ships (each race has normally at least 3 or more and they can have different weapons as well) are amazing. I love that the combat area is surrounded and can't be exited. This allows you to corner your opponent. The race dialogue and story line is much better on SCO as well. You can tell that they hired some really talented writers for this, and is shows. While some of the quest seem similar to SO2, they put their own twist on it. The hyperspace travel is a wash as they are both so similar, however I do like that as you pass by a star system in SCO, you can actually see the ships and planets in the system. I also love the addition of the starbases. This basically replaced quasi-space. The planetary exploration in SCO still needs some work, especially early on when you have not yet purchased the planet lander stabilizer thing. I have two of those, and it makes the planet lander bearable. If they would just reduce the height of all the terrain by 100%, I think it would be perfect. Some of the planets are just way do bumpy, which makes it hard to get around. The tracking of the quest you need to do is very good on SCO and was non-existent in SC2. Also, it logs each event that you trigger as well. I also like that you can put pins on the starmap for important places, and then give them a textual label and color them. They do need to add a way to keep track of what star systems you have visited already. You can't really do that with the pins. My opinion is that Stardock did an amazing job with keeping the original SC2 flavor to the game, but added lots of new features. And I am looking forward to modding this and making my own multiverse. This is only the second Stardock game I have purchased. The first was Sins of a Solar Empire, and one of the expansions. I thought it was a very good game, thus the reason I bought the expansion. I find it hard for someone to say that they feel Stardocks games are incomplete, yet they own 6 of them? Obviously you felt they were complete enough to continue buying their games. And please don't get me started on the legal crap. It boils down to this: Stardock bought the rights. Stardock took the chance. F&P had the chance to buy the rights, but they did not. Plus they just waited too long to decide to make a sequel, and that makes me made at them. How long have we been screaming for a sequel? And then after another company buys the rights ($400K), you then want to do a sequel? It's like they wanted to wait until someone else stirred up the SC2 excitement and then decided they wanted to swoop in and take advantage of the timing. Sounds suspicious to me at best. While I would probably buy the game they are wanting to release, I am actually more looking forward to Starflight 3. Stardock, once again thank you for doing what F&P did not, actually make another SC game! And please don't get me started on the legal crap. It boils down to this: Stardock bought the rights. Stardock claims they bought the rights. But Stardock makes a lot of unsubstantiated claims. 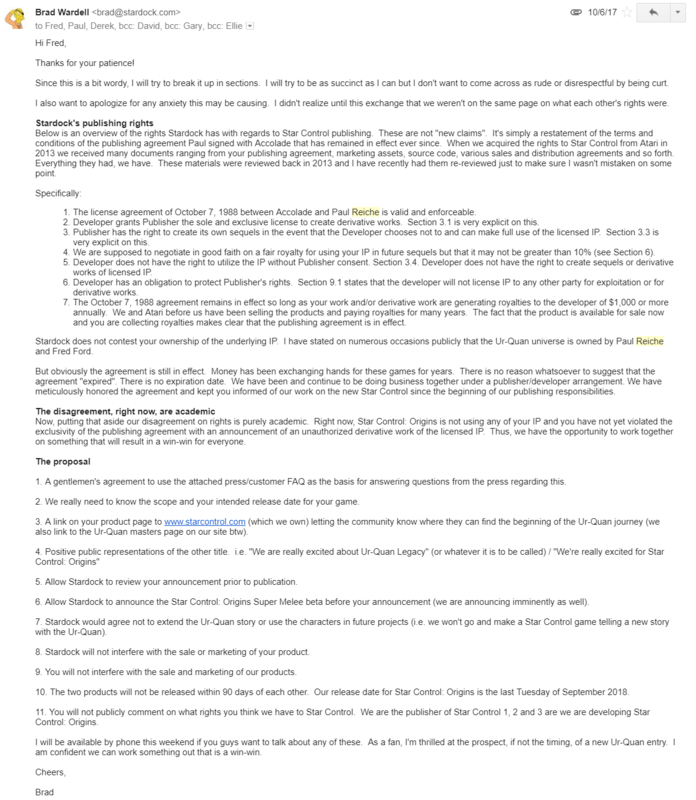 The bankruptcy sale only seems to list the "Star Control" trademark (singular, just one trademark), and the copyrights new to Star Control 3 (which don't seem to be getting any use). Heck, previously Stardock claimed it had no right to the aliens, and yet here we are. At least Paul & Fred's claims have been consistent. And Paul & Fred passed up quite a lot of money to retain those rights for themselves. If you convert to 2018 dollars, their side of the IP was actually valued significantly above what Stardock paid for the trademark + SC3 IP. I am a HUGE SC fan. Aww, don't be so hard on yourself. Some of the planets are just way do bumpy, which makes it hard to get around. And it doesn't help that the camera lags behind turning, so that knowing which way the lander will point when you've stopped turning is really difficult, makes combat extra hard. That camera should be locked behind the lander, and should have a target reticle. The Bumpy-ness of the planets was annoying for me. I fixed this by going into Ships> ship components > Lander anti gravity module and changed the value from 2 to 4. The super jump lander is now actually fun. Now we bounce like we did back in the first Beta's! Its great. Now I can do several large bouncy-trouncy jumps and get over the silly walls of some of the 'canyon-esque' planets.